Monster Hunter: World loves crossover events. Whether than means dressing up as Devil May Cry’s Dante, masquerading as Horizon: Zero Dawn’s Aloy, or battling Final Fantasy monsters, World’s various event quests lift liberally from other games. Last night, while no one was really paying attention, World snuck in an entirely new quest featuring outfits from Assassin’s Creed. The quest is tough, and the gear fits in nicely with the monster-slaying simulator’s vibe. 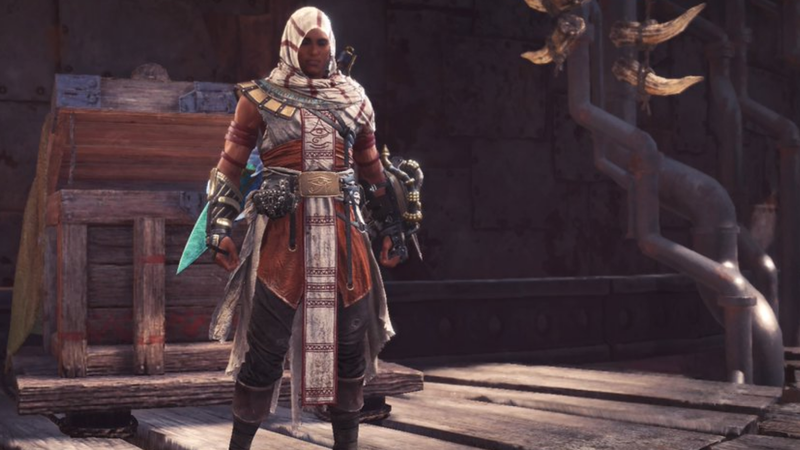 If you want to look like Assassins’ Creed Origins’ hunky nice guy Bayek or don a cloak like Ezio Auditore, you’ll want to participate in the latest event quest “SDF: Silent, Deadly, and Fierce.” Unlike most event quests, which are announced with fanfare on social media, Monster Hunter’s Twitter played coy, only saying that quest awarded “special materials.” It turns out that means layered armor and a brand new Assassin-inspired mantle. Pretty sneaky! The quest itself is challenging. Players face off against three of the game’s most aggressive creatures: an Odogoron, the pickle-shaped dinosaur Deviljho, and the super dangerous elder dragon Lunastra. The first two monsters spawn right into the arena, and it’s easy to trick them into fighting easy other while you use special equipment like cannons and ballistae to chip at their health. Once one monster drops, you can hop in and rumble with the other. The trick is to be aggressive and really go to town. Defeat the first two, and Lunastra arrives. These are ferocious beasts, and you need to match their wild ways. Unlike other event quests like the tiny monster-littered Universal Studio quests, SDF: Silent, Deadly, and Fierce is a flat out beatdown, but a really fun one. If soloing is tricky, you should be able to find players running the quest in your session, so don’t be afraid to team up. Each successful run grants a Senu Feather, a keepsake from Bayek’s trusty eagle. Once you have two, you can exchange them for a reward. The first is a cosmetic armor set that turns your appearance into Bayek’s. Like Aloy, he fits in well with the game’s aesthetics. I can see players busting out this character skin from time to time for a silly change of pace. It might not have the solid stats and practical benefits of rewards like Dante’s armor, but it’s still neat. The other option is a mantle that looks just like Ezio Auditore’s iconic cloak and acts similar to the stealth-granting ghile mantle. This sneaky little event adds some color to the game and slides in right before the lead-up to a story-heavy Witcher 3 tie in and the upcoming Iceborne expansion. There’s also a brand new, “arch-tempered” form of the gold loot-dropping Kulve Taroth around right now. These events help keep the game fresh and provide a challenge. The Assassins’ Creed event will only take a few tries to get everything, but between the fun loot and intense fight, it’s definitely worth checking out.